Not everyone knows what Baba Ghanoush is. Or maybe you do, but I put a fun twist on this classic middle eastern dip. The main ingredient is eggplant. I personally have never liked this spread that much. But, whatever I did today in my "plantry' has forever changed my mind. That purple veggie has never tasted so delicious. 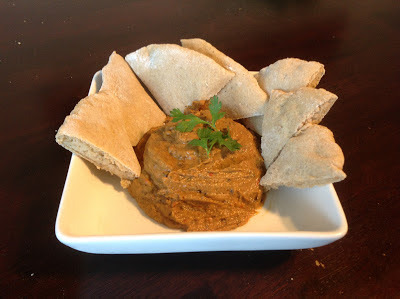 I made a few variations to the typical baba ghanoush recipe, either because I wanted to make it my own or because I didn't have certain items in my "plantry". I was a bit ambitious today and decided to make my own whole wheat pita triangles as well. They are a great accompaniment to this dip along with fresh cut veggies. preheat oven 375. Slice the eggplant lengthwise into how many slices you prefer. Cut the red pepper in half and clean out the seeds. Lightly oil the eggplant and red pepper and place on a baking tray with the garlic. Bake eggplant and garlic for about 15 minutes. Rotate the red pepper so all sides are blackened, total time in the oven being 25 minutes. Place the red pepper in a plastic bag and let it "sweat" for about ten minutes, then peel and disregard the blackened outside layer. In a blender, blend all of the ingredients until smooth. Let cool in the refrigerator and enjoy at a get together, for an appetizer or for a great snack! Tip of the Week....It's Okay To Be Salty. Light Late Night Snack....Baked Eggplant "Fries"
Who is Sarah and what's the plantry?